Breaking bread together… it’s not just a turn of phrase. It makes sense. For millennia, man has sat down with other men for community, for friendship, for peace. World leaders do it. Church congregations do it. We meet over food for business gatherings and first dates. The idea of food and companionship is rooted in us as deep as the instinct to protect our young.Perhaps that’s why Arkansas’ food festivals are so important to us. They’re a chance to meet over food with a larger sample of the population; the enjoyment of the communal experience excites and inspires us. And perhaps that can explain part of the reason why I found myself one Thursday in August on the interstate, heading to the state’s furthest northwest corner to sample the fares at the Tontitown Grape Festival. I’ve been before -- back in 2000, on a whim. I’d heard about the festival for years and drove up to check it out. Even as late as that date, Tontitown was clearly divided from neighboring Springdale; the shopping malls and gas stations stopped at the border in-between, and the next stop was St. Joseph’s Church. Well, NWA has bloomed (that stands for Northwest Arkansas, for readers beyond this state’s borders). Blossomed into a heaving metropolis. And all sorts of businesses and restaurants and convenience stores now litter the way to St. Joseph’s… even a storage unit rental business with the cryptic message “she said yes” on its marquee. This trip around, I came prepared… not just with appetite or curiosity, but with shopping bags. Yes, even I can be lured into the role of frantic consumer now and then. I brought the bags along, just as I timed my visit in the 95 degree heat, for one special facet of the festival. I was also sure to bring my own containers of water, too; while water is sold at the festival, they’re really unconcerned what you bring in with you. When I arrived, I was ushered towards free parking around back of the church, then left to my own devices. There’s no big sign with an entrance suggestion -- you just go in wherever you can. No fences here, except those around the carnival attractions to keep kids safe from machinery. 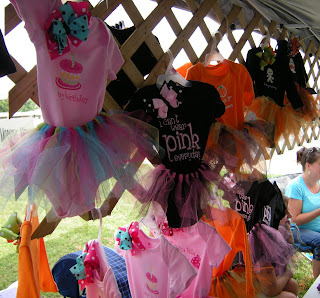 The festival booth was selling all manners of souvenirs such as aprons and t-shirts and commemorative cups. Free event books were also available, and cookbooks were out for $8 each. I moseyed past the various vendors, selling all manners of items, such as onesies for babies with cute quotes, sunglasses, jewelry, votive candles and wooden key chains with your name written right there (they even had one with my daughter’s name on it, to my surprise). There were booths for both of the local papers, a couple of book signing tables, Sand Art, and spice mixes. All in the comfortable shade of the alley in front of the old church and complex. But this too was not my destination. I smiled as I ambled past, taking in some of what was being offered around me but headed to my goal at the end of the row. I entered the double doors of the old church and breathed in the mustiness… of thousands upon thousands of books… books that I could take home with me. The Book Sale is a big component of the festival. For the rate of 50 cents for a hardcover or a quarter for a paperback, it’s a chance to stock up on reading material. This year around I was looking for kid books, and to my amusement I picked up such titles as “What Colonel Glenn Does At Work” (about his life as an astronaut) and “Behind The Headlines” (about the business of newspapers -- written in the 50s). I even found a neat kids book about how television works -- dated 1949! I also picked up a history book, a cookbook, and a couple of novels, and packed the shopping bags I brought for the grand total of $2.75. Imagine that! The old church has seen better days. There are water marks on the ceiling where the roof has failed, and some of the windows are boarded over. I overheard one of the volunteers lamenting that the book sale will move to another building next year. I hope that’s so the old church can be repaired. It’d be a shame to lose such a pretty example of turn-of-the-century architecture… turn-of-the-19th-to-20th centuries, that is. See, the church and the festival have been around a long time. Italian immigrants settled here in the late 19th century. They farmed together, lived together, and broke bread together. They also, as you might assume, made pasta together. That’s how the festival got started -- as a day taken to celebrate the harvest. 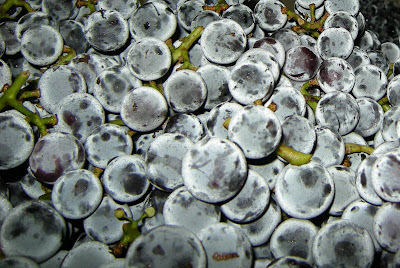 The “grape” part of the festival was added when the vineyards the immigrants started began to produce grapes. Since the first celebration in 1900 (I’m guessing at that, honestly), the party’s grown from one day to several, and now it spans the better part of a week. There’s a fantastic history of how all this came about at the festival website. I wonder if the leaders who molded the festival to its current laid back schedule thought having a lot of the festivities at night was a good idea to escape the worst of summer’s heat, or because during the day folks were still working on that harvest. Who knows? 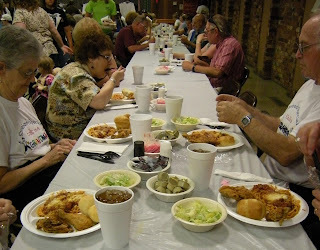 One of the big things that’s developed from the idea of that sit-down get-together is the Italian Spaghetti Dinner. We’re not talking small potatoes here. 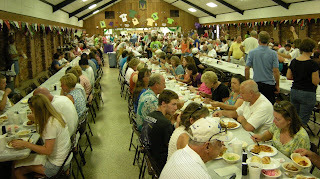 When I emerged from the book sale and sauntered back down the row of vendors, I could see the end of the line that had formed for the dinner. It rolled back from the cafeteria hall back around past the front of the new church. People were just calmly standing in line, waiting for their chance to enter and eat. Tickets are sold for the dinner, I’m sure to help folks keep track of who’s where and to keep there from being a bottleneck at the front of that line. They run $10 for adults and $5 for kids. And festival folks expect to sell 8000 of those tickets this year. The wait wasn’t as long as I feared on that line -- about 10-15 minutes. No one seemed in that big a hurry. I suppose if they were they could always check out the Carry-Out line kindly offered on the side. And the food was good -- a deep rich and slightly spicy sauce over pliant and tender noodles, with a couple of pieces of classic fried chicken, a green salad, a roll and about as much iced tea as I could handle. I loved watching the volunteers -- the ones in the kitchen, sure, who were getting everything together in assembly line fashion, an efficient machine. 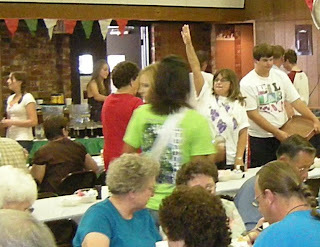 But there were also the volunteers out in the hall, who carefully and quickly cleaned up after each set of diners left, then held up fingers in the air to show how many spots were available at their location. 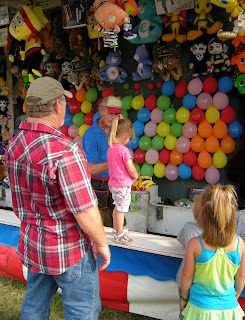 After dinner, it was off to the carnival. 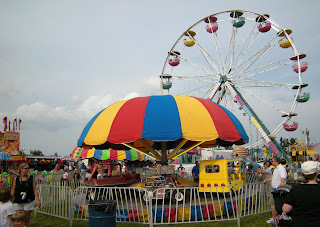 This one was worthy of any county fair -- plenty of kiddie rides, a few scary ones that’d make me toss my cookies if I even attempted to board, a carousel, a Ferris Wheel, and plenty of carnies and games. 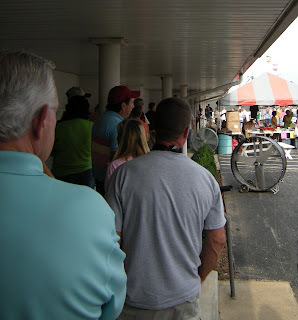 The initial line for the carnival tickets stretched out quite a ways at 4pm, but by six things were running smoothly along. 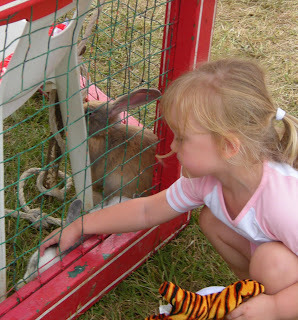 I watched for a while -- the little girl who was more interested in petting a bunny than winning one, the young lady who was racking up big prizes popping balloons with darts. Kids, kids, everywhere more kids -- and more babies than I’ve seen in a long time. Seems like there’s a bit of a baby boom around here. Facing the several-hours-long drive home, I had to call it an early evening. Fortunately for others, this was just Thursday, and there were two more fun days full of books and grapes and spaghetti and games and rides and even more ahead. 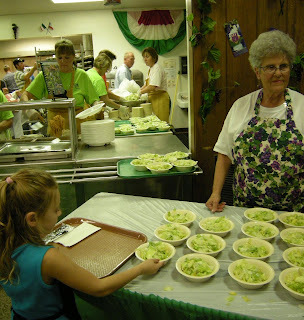 If you’d like more information about the Tontitown Grape Festival, be sure to check out their website. And if you miss it this year, there’s always the next… and the next. After all, you just don’t stop doing something after 111 years. 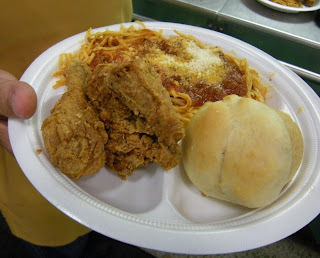 Next spring and summer, you need to check out the dinner at St. Joe, Catholic Point, Center Ridge (north of Morrilton). Similar meal, similar situation, only they've been doing it for close to 90 years, not over 100. I guess they're the "new kids". Best I can tell, the only items not made by the congregation are the butter, sweetener and I don't think they pick the tea leaves. Otherwise, it's homemade spaghetti (yes, the pasta), sauce, a hot sauce, sauerkraut, Italian sausage, pickles, bread, and a good selection of desserts. As much as you can eat for $12.50. The summer bazaar is the 3rd Saturday in June and I think the spring dinner is the 3rd Saturday in March. Oh....as always, great post Kat!